In 10-inch skillet, melt 2 tablespoons of the butter over medium heat. Add apples; cook about 5 minutes, stirring occasionally, until softened. Sprinkle with 1 tablespoon of the sugar, 1/4 teaspoon of the cinnamon and the salt. Cook about 5 minutes longer or until tender. Cool. Cut remaining 2 tablespoons butter into small pieces, then mix with flour, remaining 1/4 teaspoon cinnamon and 1/4 cup sugar. Rub ingredients together or use fork to mash together until crumbly. Add crumbled bacon. Sprinkle flour lightly on work surface. Unroll crust on work surface. Using 4-inch round cutter, cut dough into 7 circles. Gently press dough rounds into muffin cups, being careful not to stretch the dough too much. Sprinkle bottom of each dough cup with cornstarch. 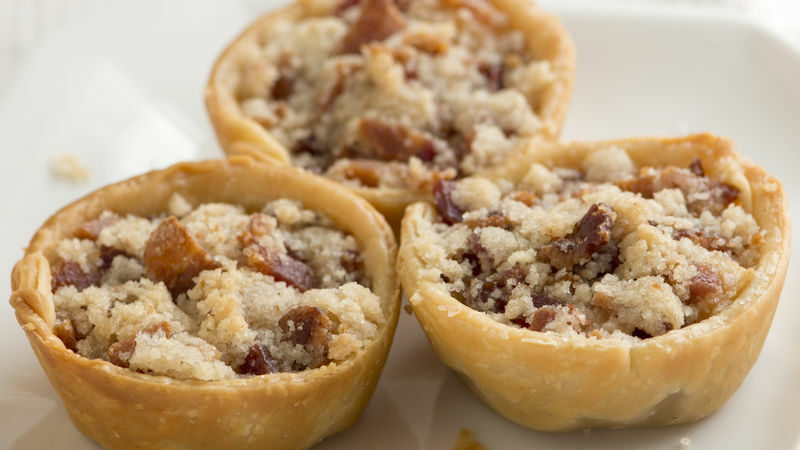 Spoon apple mixture into each dough cup; top with bacon mixture. Bake 10 to 15 minutes or until pie crust is golden brown. Instead of bacon, add toasted nuts to the topping. Use pears mixed with 1/4 cup of dried cranberries instead of apples.